I concluded Part 1 by summarizing three mistakes progressive change agents often make in trying to build a broad alignment: 1) Building from scratch, 2) Purism, and 3) Long lefty laundry lists. Summarizing the latter, it’s tempting to think that the way to attract a broad base is to name lots and lots of issues (e.g. at a rally or protest) — so that there will be “something for everyone”. Perhaps counter-intuitively, “…the more issues you name explicitly, the less your appeal tends to resonate with any of the constituencies you’re hoping to attract. The more we spell out how each issue is explicitly connected, the less it becomes about a particular issue (i.e. entry/identity point) that any particular person, group, or social bloc is concerned about.” [Long lefty laundry lists]. The illustrations that follow are the product of me trying to explain ideas from Ernesto Laclau’s On Populist Reason—applied to the populist struggle in Wisconsin—to a friend over drinks. Thanks and apologies to Laclau, whose insightful work I am indebted to. The above bottles represent social aggregations (commonly known as “groups”). While social aggregations don’t typically have such defined walls around them as the glass of these bottles might suggest, the boundaries are still an important feature to emphasize. Groups are containers of distinct identities. The dynamics of the group itself encourage the proliferation of these distinctions, as group members signal their belonging in the group by distinguishing themselves from other groups. Thus, groups develop distinct cultures, which can include distinctive narratives, values, politics, rhetoric, leadership styles, fashion, etc. For the sake of discussing a concrete example, these bottles represent contemporary social aggregations/groups in Wisconsin. For example, one of these bottles represents Wisconsin public school teachers, another represents university students, then firefighters, police officers, veterans, farmers, Green Bay Packers, and so on. Not all the bottles in all of Wisconsin are included here. The figure leaves out explicitly conservative groups (the hard opposition). It does not, however, leave out social aggregations that hold mixed/less-defined political dispositions. The above bottles represent the groups that could potentially be in alignment. Think of them as potential allies. Enter the contents of group identity. Each group’s identity is represented by a different color filling each bottle, to illustrate that group identities are indeed particular. Groups bond over what is common among group members, and these particular within-group commonalities also make the group distinct from other groups. Firefighters fight fires. Teachers teach. These are obvious defining features, but group identity can come to encompass infinite less obvious particularities, from fashion to rhetoric to organizational structures. Group members feel at home in their particular bottle. That is to say they identify with their social aggregation, and they concern themselves with the affairs and priorities of their group — much more so than with the affairs of other groups. A teacher may be thankful that firefighters exist, and vice versa, but that doesn’t mean either typically has the time or capacity to concern herself with the other’s priorities. These bottles can represent all sorts of groups and aggregations — not just professions (or unions representing professions). One bottle could represent Methodists, another could represent the NAACP. To repeat, social identities don’t typically have such neatly defined boundaries as a bottle may suggest. And, in modern society, individuals’ identities tend to be unevenly dispersed across several groups (e.g. workplace, religion, family, neighborhood, hobby, etc.). These groups are each doing their thing. The NAACP may be focusing on a particular campaign that grows organically out of the group identity and reflects group-constructed values and priorities. The Methodist Church may in similar form be focusing on different priorities. The AFL-CIO will probably have other foci, and, within the AFL-CIO, different trade unions will have different priorities too. Students might be all over the place, clustering by their interests: from hobbies and sports to academic disciplines to activist groups that focus on a variety of issues. Groups with explicitly political agendas would probably love for all the other groups to concern themselves with that group’s priorities. But there are only so many hours in a day, and groups and their members can only have so many priorities. This emerging layer of commonality creates a new opportunity to, as Robert Putnam would say, bridge between groups. Ernesto Laclau would say that this common layer of each group’s particular identity creates an equivalential logic, which is to say that each group starts seeing each other group’s grievances as equivalent to its own. The ingredients for a new (or at least powerfully refreshed) public start to emerge. In this figure Gov. Walker and company single out a target: public workers, represented by the elevated bottle, which Walker wants to break (i.e. strip them of their right to bargain collectively). The foaming red layer in each bottle—in each group’s identity—causes each group to see the attack on the teachers and public workers as equivalent to an attack on itself. The equivalential logic becomes an equivalential chain, binding the groups with stronger solidary ties, ultimately resulting in a kind of meta-group: a new, or at least reinvigorated, public. The potency of this freshly articulated public requires a projection of proximate group-oriented instincts—the group-serving instincts that are a day-to-day part of our experiences within proximate groups (i.e. local, tangible, concretely experience-able groups)—onto a much bigger and more abstract conception of a group (i.e. a public). Thus the proximate group provides a level of commitment and solidarity that only comes through face-to-face, flesh-and-blood, strong-tie organization, while the equivalential chain between many groups facilitates the projection of this strong within-group solidarity onto a broader alignment. This figure illustrates what I just described playing out. The red line represents the equivalential chain, which connects the freshly politicized—now fully adversarial toward Gov. Walker—layer of each group’s identity. The public workers “bottle” becomes a symbol that each group sees itself represented by. The public workers become a catalyzing floating signifier, signifying the new alignment. And almost overnight hundreds of thousands are mobilized in Wisconsin, constituting what we might call a quintessential populist alignment. Wisconsin’s public workers became a catalyzing symbol in which each group in the emerging populist alignment saw a reflection of itself — and to which each group saw its own prospects and future tied. Populist alignments require such catalyzing symbols. The symbol serves to name/crystallize the new public. It is the essential focal point that allows groups to extend their strong internal solidarity—derived from within-group bonding—beyond themselves. I want to discuss three important things about such a catalyzing symbol: 1) the symbol is necessarily ambiguous, 2) the symbol is not inherently progressive in character or result, and 3) the symbol can take many different forms. I will briefly discuss these in reverse order. The symbol can take many different forms. Paste George W. Bush’s face over top Scott Walker’s and think back to the waning days of the Bush Administration. The electoral campaign of then-candidate Barack Obama provides another example of a populist alignment. Obama himself became the “catalyzing symbol in which each group in the emerging populist alignment [saw] a reflection of itself — and to which each group [saw] its own prospects and future tied.” Bush had become such a villain to so many swaths of society by the end of his presidency that that red layer in those bottles—the layer of identity that is in opposition, typically to an authority—had profoundly shifted many group identities in US society. Obama the candidate emerged as the symbol to which so many social aggregations came to see their hopes tied. In the case of Wisconsin, a group served as the catalyzing symbol—under the label public workers—and they were thrown into this role overnight by forces beyond their control. While in the case of the 2008 election, one person—candidate Barack Obama—served as the symbol, and he emerged as such over a longer period of time. The symbol is not inherently progressive in character or result, which should have already been apparent to most readers through my discussion of Barack Obama as a catalyzing symbol. But the Tea Party as catalyzing symbol makes this even clearer. All sorts of populist moments are possible — from the French Revolution, to the New Deal, to the rise of Adolf Hitler and Nazism. Populism is a kind of formation; a pattern and process of political alignment between social forces in relation to opposing alignments. All shades and stripes of political ideologies can and have strategically engaged in populist strategy — sometimes ushering in profound advances in social equality and human welfare; sometimes resulting in the worst horrors of human history. In Part 1, I labeled rightwing populist alignments faux-populism, but these alignments are still engaging the same form I have described and illustrated above. The symbol is necessarily ambiguous. For a catalyzing symbol to appeal to a lot of different groups at the same time—for a diversity of constituencies and interests to see themselves and their hopes reflected in the same symbol—it must necessarily be ambiguous. The symbol is more about a general, ambiguous direction than it is about detailed solutions. The more you dig into the details—the more you try to nail down the symbol’s precise significance—the more the myriad differences between groups’ particular visions and goals come into focus. You risk emphasizing difference in a political moment that demands an emphasis on universality. You risk exposing fissures in the tentative populist alignment. Take Occupy Wall Street as floating signifier. Defying critics on the right and left, OWS refused to spell out a platform or even list any demands. Instead, its visible defiance against Wall Street and its slogan—“We are the 99%!”—ambiguously (and popularly) framed a class conflict, and in so doing changed the dominant national conversation overnight, from a conservative pro-austerity narrative to a commonsense critique of social and economic inequality. It framed a different public than the one conservatives had framed so successfully for most of the past three decades, and in so doing provided a powerful new alignment of students, unions, national advocacy organizations, community groups, religious organizations, and a bold youth movement. This is why Ernesto Laclau labels these catalyzing symbols empty signifiers. I prefer the term floating signifier, but what Laclau is getting at is this necessary ambiguity.2 It is conceptually useful to think of the meaning and content of the symbol/signifier as empty or floating, and to study its function in naming/signifying/crystallizing the new populist alignment. A populist alignment will not crystallize without this necessarily ambiguous symbol. You could try to write a document that spells out all of the concerns of a myriad of groups with diverse interests, but in the writing you will undermine the ephemeral unity of the groups. You might realistically be able to get some radicals from the edges of multiple issue areas together to write such a document, but it’s not going to unite anyone other than radicals; by trying to spell out everything, you lose nearly everyone. This is one reason why sectarian groups that try to organize “the masses” by first trying to refine everyone’s political analysis are perpetually not getting anywhere (other than in the way). When a challenger social movement like OWS hits upon such a broadly resonating catalyzing symbol, it’s like striking gold. One might even argue that broad social movements are constituted in the act of finding their floating signifier. Hitherto disparate groups suddenly congeal into a powerful aligned force. Momentum is on their side and things that seemed impossible only yesterday become visible on the horizon. It becomes imperative for the forces defending the status quo to tarnish the challenger movement and its symbols — to destroy their popular appeal. This tarnishing strategy is accomplished by nailing down the floating signifier — by fixing it to particular meanings, associating it with particular “kinds of people” (e.g. “dirty hippies) and to narrower frameworks, so that it can no longer function as a popular symbol. OWS’s opponents predictably mounted a sophisticated public relations offensive to nail down the floating signifier and negatively brand the emerging movement. They worked to caricaturize, stereotype and otherize the most visible actors—the occupiers—in order to inoculate more Americans from identifying with “the 99%” and disuade them from joining the movement. This playbook attempt to negatively nail down a floating signifier—and the successful thwarting of the attempt—is illustrated clearly in the case of candidate Obama as floating signifier. The consistent Republican strategy throughout the campaign was to attempt to overly associate Obama with particular constituencies and concerns—to nail him down and fill the contents of the signifier in calculated, maligning ways—in order to prevent other groups in the emerging populist alignment from being able to see their own identities and hopes in the symbol of Obama. Obama dodged metaphorical bullets like Neo in the Matrix. His steady retort—most remarkably demonstrated in responding to his association with Rev. Jeremiah Wright—was to associate himself with universal elements of multiple identities. This feat was performed with tremendous skill (and self-conscious preparation, utilizing Marshall Ganz’ “story of self, us and now” framework). All of this is to demonstrate the critical importance of the ambiguity of the catalyzing symbol in the construction of a populist alignment. This idea of positive strategic value in ambiguity may offend some progressive sensibilities. We tend to want clarity. There are certainly times when clarity is precisely what is called for. And, to be clear, there can be a tremendous cost to this necessary ambiguity. But effective social change agents must befriend ambiguity. If you can’t turn off your need for clear definitions in some moments, you may well attain your clear definitions. But you’re not likely to build the kind of collective power we need to start turning this thing around. 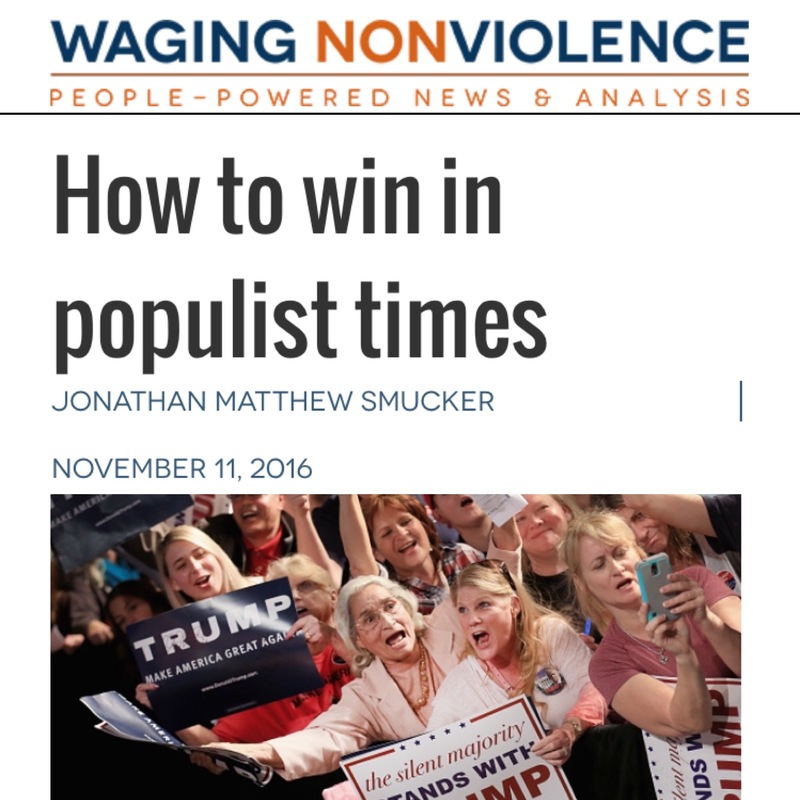 A large part of this post is adapted from Wisconsin: How Populism Works | Populism & Hegemony pt.5 and some language is adapted from The Tactic of Occupation & the Movement of the 99%. While the signifier is floating (i.e. not peg-able), it is not empty of content. It has to be meaningful enough to resonate. Moreover, different symbols tend to pull things in different directions. Candidate Barack Obama as floating signifier, for example, pulled a lot of grassroots energy into what has turned out to be an establishment-reinforcing direction. Occupy Wall Street as floating signifier, on the other hand, pulled a lot of establishment forces in the direction of the fired-up, social justice-oriented grassroots. Thanks for spelling this out Matt. Just finally went through and read all of your posts. I find that it’s really refreshing to think in terms of attempting to become the dominant hegemony. Feels more honest, and once you are thinking in that framework it seems easier to clearly strategize ideas about moving forward. An observation about floating signifiers: It seems that some of the time these are created organically, or are forced into the position of being the floating signifier (example: public workers). But sometimes people are able to create one at the right moment, which then catches on – an example being ‘We are the 99%’ Seems worth noting the difference. Should we be attempting to create these continually, wait for the right moments to insert them through organizations/movements that have some amount of power? I guess I’d just like to hear your thoughts about the difference between the two, if you feel like it’s a distinction worth discussion. Pingback: common pitfalls of challenger movements « Devoke the Apocalypse. Pingback: A theory of political behavior (pt.4: imagined communities & populist alignment) « Devoke the Apocalypse. Pingback: underdog vs. winning team impulses « Devoke the Apocalypse. Pingback: Theory of Political Behavior SERIES « Devoke the Apocalypse. Pingback: Anatomy of populist hegemonic alignment (part 1) | Devoke the Apocalypse.